I made a cute Hello Kitty bunny card to show you. I just love my new Cricut Explore and that I can now cut SVG's too! 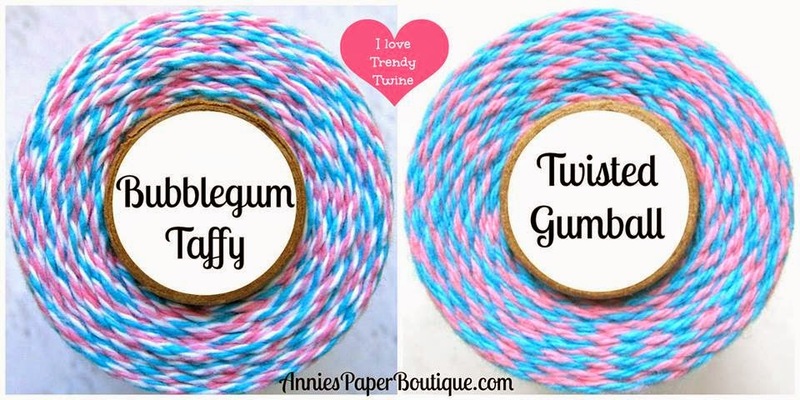 We are featuring Bubblegum Taffy and Twisted Gumball Trendy Twines this month. I used one of my favorites (it's really hard to have one favorite Trendy Twine), Bubblegum Taffy on my card. For the challenge, you need to use Trendy Twine, Easter or floral them and stitching, real or faux. Hop on over to Twine It Up! with Trendy Twine to see the other great projects from the design team. And stop by Annie's Paper Boutique to stock up on the twine specials and your Easter goody packaging supplies! I hope to see your project on the challenge link--Have a fabulous day!! OMG Helen.....HK is just as cute as can be!!!! What an adorable card and LOVE the colors!!! Those sequins look AWESOME too!!!! Too cute Helen, love those bunny ears!! Awesome card!! Love that bunny!! ;) Those sequins are such a perfect addition!! Simply ADORABLE!! Adore Hello Kitty!!! Love your sweet card, the Hello Kitty is just so precious! OMGosh!!! This is so cute. Love that sweet HK and all the pretty colors.